Jasmine Schmidt has taken on the role of Program & Community Outreach Coordinator, and will be the POC for mentees and community partners moving forward. Jasmine can be reached at jasmine@streetwisepartners.org, and would love to connect with you! The bi-annual Community Partner Breakfast is coming up! Please save the date: Wednesday, July 19th from 9-10:30am. Our Fall 2017 partner referral guide and mentee flier with fall dates are now ready and available below. StreetWise Partners FREE Career Mentoring Program! Receive individual career guidance and expand your professional network through our 3-month mentoring program hosted at top DC corporate offices, Gallup and White & Case! 1) All applicants MUST attend an information session in central Washington, DC. Please sign up here. 2) Applicants also need to fill out an online application, although it will not be processed until you’ve attended an information session. You are welcome to fill it out in advance here. Questions? Please contact Emily Starace, Senior Program Coordinator, at emily@streetwisepartners.org. * PILOT PROJECT FOR TEACHER TALK – An In-App Live Teacher Chat is now available. * The $699.99 program cost is paid by the sponsors and partnership. There is a fee of $39.99 paid by the student that covers the cost for streaming, student support, customer support and materials. All student fees are reinvested to improve the program and reach more families. The Project does not create a profit. These programs are priced so that every student and family can have equal access to quality, full semester-length SAT and ACT prep courses. No student needs to be left behind! These programs have everything students need to be totally prepared for the exam and position themselves for scholarships. If you have any questions check out our information site. For more information regarding your options, please contact Cheryl Litras at 951-256-4076 or email: cheryl@eknowledge.com. The Donation Project waives the full retail price of $350 for all Standard Programs. There is a student fee of $14.99 that covers for streaming, student support, customer support and materials. All fees are reinvested to improve the program and reach more families. The Project does not create a profit. 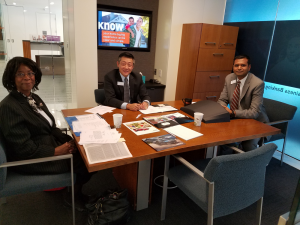 Constance A. Burns, founding president, chief executive officer, and Veterans’ service administrator for the National Association of American, Inc. (NAAV), met with Sam Howlader, vice president and branch manager and James C. Kim, market manager and executive vice president for the PNC Bank at 800 17th Street, NW, Washington, DC to discuss plans to provide financial support and assistance for service members and veterans in the areas of employment and training. The PNC Bank will also sponsor other group activities through NAAV related to caregivers of veterans at the Walter Reed National Military Medical Center in Bethesda, Maryland and the DC VA Medical Center in Washington, DC. We are now underway with recruitment for our Fall Career Ventures Programs, and we want to serve your clients from National Association of American Veterans in our upcoming programs. To refer, please direct interested candidates to register online for an information session (link below); once we receive their registration, we follow up with them to provide location details and guide them through the application process. Please see below for a reminder of the qualifications for our program and our fall program dates, and don’t hesitate to follow up with me with any questions! Support the National Association of American Veterans by becoming an ACN Customer! ACN is the largest direct-selling telecommunications company in the world with market presence in 24 countries, more than a million customers and annual revenues exceeding half a billion dollars! ACN provides home and business customers with the telecommunications and essential services they already need and use every day, as well as the cutting-edge services of the future. You’re buying these services anyway. If you buy them from ACN, NAAV will receive a percentage of your monthly billing. In other words, our organization will receive a direct financial recurring amount from ACN for as long as you remain an ACN customer or for the term of your agreement. A nationwide program, which receives donated adapted vehicles and distributes them, free of charge, to local needy individuals. They have a special emphasis on helping disabled veterans, as a small token of appreciation for their dedicated service to our country. This provides a wonderful legacy for the donor, as well as the best IRS tax deduction for a vehicle donation; since the vans are not sold, but are instead transferred to a needy recipient. 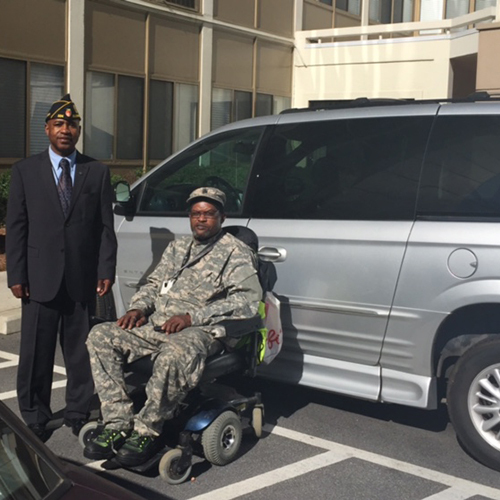 If you know of someone who has an adapted van, for a wheelchair or scooter, to donate …or is in need of one, please visit www.mobilityforvets.org to learn more. The Society of American Military Engineers (SAME), the premier professional military engineering association in the United States, unites architecture, engineering, construction (A/E/C), facility management and environmental entities and individuals in the public and private sectors to prepare for—and overcome—natural and manmade disasters, and to improve security at home and abroad. The National Association of American Veterans (NAAV) and MobilityWorks have developed a partnership with the common objective of assisting disabled American Veterans. Through their network of over 60 stores and the largest inventory of wheelchair accessible vans, cars and trucks, MobilityWorks personalized approach finds the best solution for veterans unique needs. MobilityWorks believes every person deserves to be connect to who and what matters most in their lives.